Tonight, Anarchy Championship Wrestling hosted their annual American Joshi Queen of Queens tournament at The Mohawk in Austin, Texas. Last year’s winner, Athena, has vowed to defend her ACW Televised Championship in any and all matches she participates in during the tournament. Results from the show are coming to you thanks to ACW and @IndyFanatics on Twitter. * First Round Match: Angel Blue def. Addy Starr to advance to the semi-finals. * First Round Match: Leva Bates def. Angelus Layne to advance to the semi-finals. Bates was dressed as Padmé Amidala from Star Wars Episode I: The Phantom Menace. * First Round Match: Athena def. Claudia del Solis to advance to the semi-finals and retain her ACW Televised Championship. * First Round Match: Barbi Hayden def. Su Yung to advance to the semi-finals. * Semi-Final Match: Angel Blue def. Leva Bates to advance to the finals and retain her American Joshi Championship. Bates was dressed as Padmé Amidala from Star Wars Episode II: Attack of the Clones. * Semi-Final Match: Barbi Hayden def. Athena to advance to the finals and WIN the ACW Televised Championship! * Final Round Match: Angel Blue def. 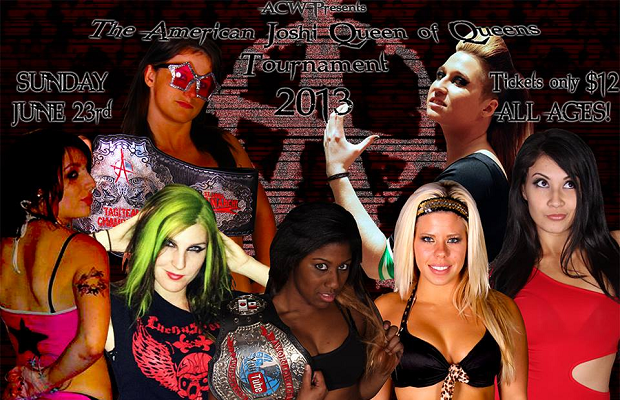 Barbi Hayden to WIN the 2013 American Joshi Queen of Queens Tournament and the ACW Televised Championship!